Toronto City Centre Airport (commonly called “Toronto Island”) is a great airport for baseball fans, since it’s only about a 15-minute walk from the Roger’s Centre/Skydome, where you can drop by to see the Jays play the Bosox, Yankees, etc. It turns out that the airport has an even closer connection to baseball. The Boston Red Sox signed Babe Ruth in 1914, but sent him down to their triple-A Providence Grays farm team for the 1914 season. Late that season, on September 5, when the Grays were playing the Toronto Maple Leafs baseball team at Island Stadium in Toronto, Ruth hit his first professional home run, pounding the ball right out into the waters of Toronto Harbour. 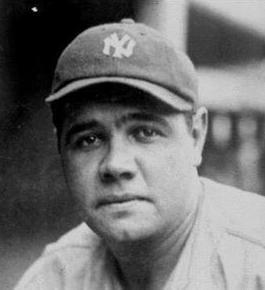 The next year, the Bosox called Ruth up to the majors, and he famously hit his first major league home run — but not his first professional home run — against the Yankees on May 6, 1915. Meanwhile, the [baseball] Leafs decided to move their stadium north to a mainland location, and in the 1930s, Toronto built its main airport on that empty land. After World War II, when longer runways and less fog became desirable, most airline operations into Toronto shifted northwest to the distant Malton airport (now Toronto Pearson International Airport), but the little airport built over the stadium where Babe Ruth started his professional home run hitting career is still in operation, still has airline traffic, and still sees lots of baseball fans passing through. This entry was posted in Uncategorized and tagged places. Bookmark the permalink. Wow, an airport built over the baseball park where Babe Ruth hit his first professional home run. You’re right: that is a fascinating connection. Thanks for telling us about it.